Twists and turns aplenty in the title race, as Man City’s shock defeat at Newcastle wasn’t fully capitalised on by Liverpool, drawing 1-1 at home to Leicester. FPL managers were firmly focused on Mohamed Salah (£13.6m), whose 1,984,312 captainers were disappointed by only his second blank in seven matches. Eden Hazard (£10.9m) continued to infuriate his owners by making it five games without a goal, as Chelsea were humiliated in a 4-0 loss at Bournemouth. The true villain, though, is Lucas Digne (£5.3m). Everton’s flying full-back has had an outrageous seven Gameweeks – scoring negative points on three occasions, yet delivering hauls of 12 and 17. His 15% ownership is set to freefall after firstly being benched at Huddersfield, then coming on and receiving a straight red card for a professional foul. The Frenchman will miss half of Everton’s Double Gameweek 25. “Ok, here’s what we’re going to do. A slightly above average score of 47 was largely due to the successful pairing of Aleksandar Mitrovic (£6.5m) and Pierre-Emerick Aubameyang (£11.3m). The former bagged a brace and 13 FPL points as Fulham beat Brighton 4-2, which consequently resulted in -1 points for Shane Duffy (£4.6m). At home to Cardiff, Aubameyang would normally be the frontrunner for the captaincy armband but the fear of Salah pushed many towards that direction. The Arsenal man punished them with a goal and an assist. Zero points came from the injured Laurent Koscielny (£5.4m) and Anthony Martial (£7.2m), as well as the booked Aymeric Laporte (£5.9m). The algorithm chose Paul Pogba (£8.7m) as captain, whose penalty helped Man Utd escape the reality check of a home defeat to Burnley. He then proceeded to limp off. The January transfer window closed on Thursday with very little activity, although owners of Aboubakar Kamara will have to look elsewhere for their bargain basement third striker. He has joined Yeni Malatyaspor on loan, following several fallouts with Fulham players and staff. The Cottagers visit Crystal Palace as they aim to string two wins together, although the optimum squad strongly backs the Palace defence. In goal, Vicente Guaita (£4.2m) returned to action against Southampton and would love a repeat of Gameweek 1’s 2-0 win in the reverse fixture. That was the day that introduced Aaron Wan-Bissaka (£4.5m) to the FPL world. 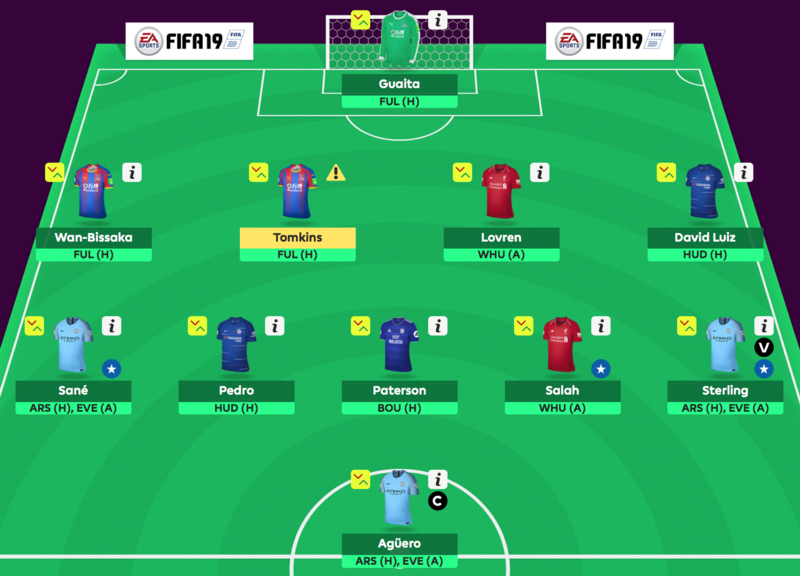 Now owned by over 33% and with a firm place in Fantasy folklore, the 4.0m-priced AWB bagged three bonus points that day and became either an inspired selection or a frustrating bench-warmer for those who spotted him early. One week later, he was sent off against Liverpool. Since that suspension, the right-back has become FPL gold by playing every minute of Premier League football for Roy Hodgson’s side and collecting maximum bonus points a further three times. James Tomkins’ (£4.3m) recent goal at Anfield reminded us of his ability to head home at set pieces. Their eight clean sheets have only been bettered by four other sides – all from the top six. If Dejan Lovren (£4.9m) regains his place in Liverpool’s defence from Joel Matip (£4.9m), the algorithm backs him to deliver at West Ham, whereas a home match with Huddersfield is a great way for Chelsea to recover from Wednesday night’s humbling. Calamitous David Luiz (£5.9m) took a lot of flak for his string of errors in the build-up to David Brooks’ (£5.1m) goal but is about to face a side who’ve only scored one goal in five games. 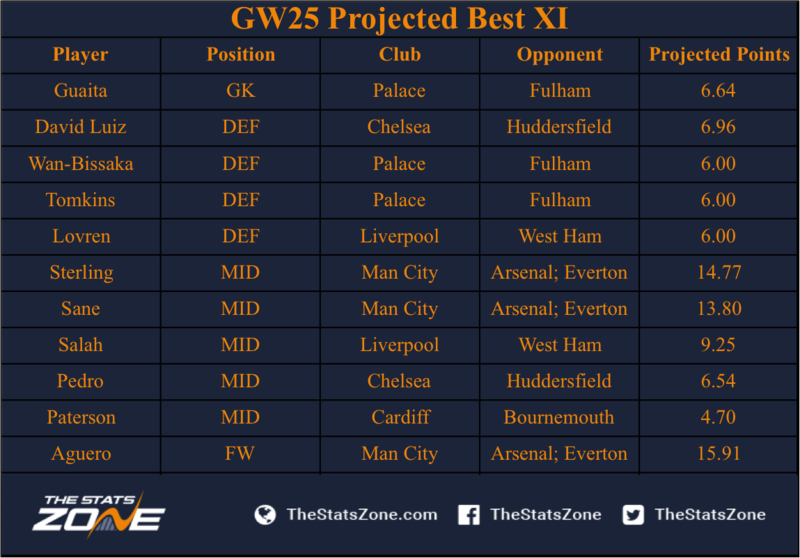 The rest of the team (and reserves) is controlled by the hastily-arranged Double Gameweek 25 for both Man City and Everton. In truth, neither have a strong pairing of games – before they meet, Man City host Arsenal and Everton host Wolves – but someone has to score the goals, so it’s wise to have attacking coverage. The algorithm has blanked the Toffees and gone with Raheem Sterling (£11.3m), Leroy Sane (£9.7m) and captain Sergio Aguero (£11.3m). Sane and Sterling always come with a slight threat of rotation, although both have started the past four league games for Pep Guardiola. Now five points behind Liverpool, they can’t afford any more slip-ups and the Spaniard will prioritise this over keeping fringe players happy. This may seem harsh on Gabriel Jesus (£10.1m), who has four goals from his last three starts but still finds himself behind Aguero, who notched the opener on Tyneside after just 24 seconds. Perfecting the rotation balance is even tougher when you see who they’re against afterwards. Within seven days, they face Arsenal, Chelsea and have a tricky trip to Goodison Park. The algorithm thinks these three will contribute 60.39 points including Aguero's captain points. They rightfully dominate the captaincy discussion but perhaps going with Salah is still best. Liverpool visit West Ham, who they defeated 4-0 on the opening weekend. That’s now four consecutive games where Liverpool have scored four against the Hammers – a remarkable sequence that should continue, considering West Ham’s 3-0 collapse at Wolves. After accruing 87 points from eight games, Salah produced a rare disappointment on Wednesday. Whilst his other recent blanks have been against the Manchester sides, a home match with unpredictable Leicester came with expectations. Blips happen, though, and it’s hard to see back-to-back blanks for the phenomenal Egyptian. Especially against West Ham. Completing the team is Pedro (£6.3m) and Callum Paterson (£5.0m). If Chelsea reach the semi-finals of both the FA Cup and Europa League, there are only two free midweek slots to fit the rearranged league games of Gameweeks 31 and 33 as well as the Brighton match that won’t happen in Gameweek 27. Assuming one can’t be wedged into the March international break, could there be a Triple Gameweek? Either that or squeezing a game on Wednesday 20th February, between the FA Cup clash with Man Utd and the Carabao Cup final with Man City. Either way, Pedro scored against Huddersfield in August and will hope to repeat the trick this time. Paterson is only projected a score of 4.7 and it seems like he’s been moved back into midfield since the loan signing of Oumar Niasse (£5.0m). A club in mourning, Cardiff will play their first home match since the tragic events that saw new signing Emiliano Sala go missing. It’s against Bournemouth, who are another side difficult to predict. However, so is the occasion. The other goalkeepers predicted to keep a clean sheet are Alisson (£6.0m) and Kepa (£5.6m). Liverpool kept 12 of them in the first 19 games but only one from the past five. They even conceded three in one match but, despite this shake, Alisson, Andrew Robertson (£6.8m) and Virgil Van Dijk (£6.5m) should soon return to their defensive supremacy. Day one of the season was so long ago – it was even a time when Marcos Alonso (£6.5m) delivered attacking returns. He’s been an FPL frustration, with owners knowing his goal scoring record, watching him high up the pitch and witnessing him hit the woodwork on six occasions – the league’s highest. Yet he’s only scored once and is without an assist since Gameweek 11. Mauricio Sarri finally dropped Alonso for Emerson Palmieri (£5.2m) in midweek, although it remains to be seen whether that chastening defeat will bring the Spaniard back into the line-up. It is in midfield where Double Gameweek assets take charge. Although Sane and Sterling are consistently starting games at this crucial time, the return of Kevin De Bruyne (£9.7m) has restricted the minutes of David Silva (£8.5m), Bernardo Silva (£7.6m) and Ilkay Gundogan (£5.4m). Nevertheless, they should all get a fair share of the 180 minutes and are tipped to score highly. So is Jesus. The three-per-term limit restricts their spots in the 11 but Hazard – projected to outscore Pedro – is benched for budgetary reasons. Both Romelu Lukaku (£10.7m) and Marcus Rashford (£7.7m) started for Man Utd against Burnley, but the comeback only started once Lukaku was taken off in the 66th minute. Glenn Murray (£6.3m) ended his barren streak with a brace against Fulham and is tipped to perform against Watford.